PALM SPRINGS, Calif. - June 2, 2018 - PRLog -- Jasson Finney will be a featured guest on The Jimmy Star Show live radio/tv show hosted by King of Cool Jimmy Star along with Cool Man About Town Ron Russell to discuss his career and the entertainment industries at large. The Jimmy Star Show is tv/radio's coolest hit show, featuring the coolest in music, entertainment, fashion and pop culture, all from a fun industry insider perspective in a completely live, unedited fast-paced two-hour conversational format. Jasson Finney has been in the fitness and entertainment industry for over 20 years. He has recently appeared in feature films such as "Hurricane Bianca: From Russia With Hate" and the ABC pilot "Get Christie Love." He also has written a series of books for children to help them become fit and healthy through an incredible cast of characters and the world's first fitness superhero Captain Pump. His first book is available for pre-order on Amazon and will be released nationwide in November. George is the janitor of a school just like yours. He wishes he could find a way to help the kids get fit and understand the benefits of living a healthy lifestyle. But unfortunately, he just doesn't know how. Until one day, a tiny fitness dynamo pops out of a magic comic book and changes janitor George's life forever. This is CAPTAIN PUMP - The World's First Fitness Super Hero. The Adventures of Captain Pump is a children's book series that takes the reader into a land of healthy and well being. The story takes place here in the REAL WORLD but the lessons are learned in a magical land where healthy living and social acceptance and respect for all people are the ways of life; PUMPLAND. Of course there is always someone or something threatening the healthy ways of Pumpland. Villains from far and wide keep the Captain on his toes as he diligently keeps the citizens of Pumpland and his friend in the real world safe. 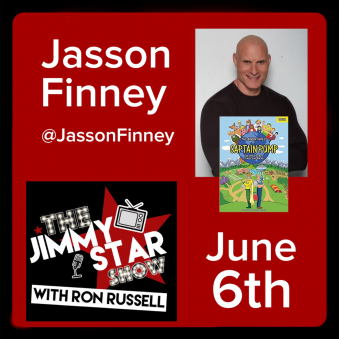 The Jimmy Star Show with Ron Russell is pleased to showcase the expertise and talent of Jasson Finney and all anticipate a fun and informative time talking with him about his career and the entertainment industries at large. Join King of Cool Jimmy Star, and Cool Man about town Ron Russell as they have a playful and sometimes wild time with the talented featured guest! To hear/see Jasson Finney live on the Jimmy Star Show with Ron Russell tune in to W4CY radio on Wednesday June 6th, 2018 from 3-5 pm ET and 12-2 pm PT online at www.w4cy.com from anywhere in the world! Snoop Dogg Teams Up With Matt Cimber In The Remake Of "The Candy Tangerine Man"